In an effort to create a familiar and comfortable venue for musicians to perform for live audiences within in the confines of an office building, V3 recently designed a dedicated performance studio inside the CBS Radio facility located in SoHo New York. 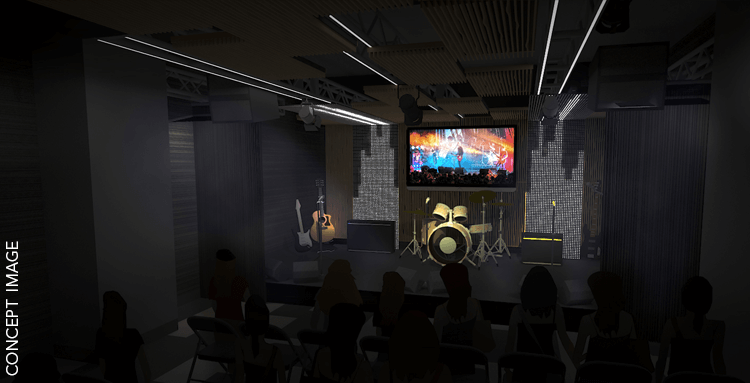 Going above and beyond a typical music performance space, the 100-person venue features acoustically isolated construction, permanent audio-video systems with the capability to record content and stream live video of every performance. The space has designed flexibility to host a wide variety of guests beyond musical performances including speakers, politicians, actors and athletes for use by the nationally recognized News and Sports stations in the facility. With executive offices above and below, as well as a Top 5 station in the US next door, a floating floor, a spring-isolated ceiling and multi-layered gyp walls were installed to mitigate sound transfer to adjacent rooms. Fully developing this unique space from start to finish, V3 designed the studio and stage set to have a New York feel including a custom-printed subway backdrop and truss system that extends over the audience to draw them into the experience. Because V3 is a truly “full service” firm (or because old habits die hard), principal Kurt Kerns also personally set up and tuned the guitar, bass and drums on stage. This attractive and functional space will now serve as a multi-tool content capture space at the CBS radio cluster in New York for years to come.